A saddle should fit like a pair of shoes! 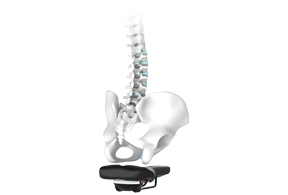 SQlab became the first saddle manufacturer to introduce a system to measure the distance between the sit bones and to calculate the optimal saddle width. All SQlab saddle models are available in up to five different widths. A bicycle saddle must not only fit perfectly to both the male and female anatomy, but also correctly spread the body weight from medical point of view. The ergonomics of a saddle is decisive when buying a saddle. More free space less pressure! The SQlab stepped saddle system creates more space for sensitive areas due to the lowered saddle nose - for men and women alike. In addition, all SQlab saddle models are also available with active technology, which provides more comfort and efficiency and is back-friendly at the same time. Right from the start, SQlab was and is the most successful saddle brand in tests conducted by German trade magazines and has been awarded several times as test winner.